While observing, Robert Mukombozi, during a lecture on his life as an investigative journalist in Rwanda. I noticed his humble but eloquent manner; humble because he had gone through more than you and I can ever begin to imagination, and eloquent because of his wide ranged education. “The voice of Rwanda” finished his schooling at Entebbe Airforce Secondary School in Uganda. From there he travelled around South Africa, the many war zones and starving people pushed him to take action with his pen. “My work for free speech has made me a better journalist – but above all it has taught me to be a responsible citizen of the world,” said Mukombozi. 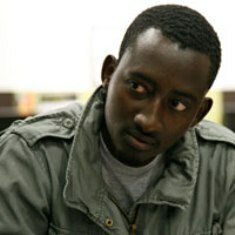 In 2008, Mukombozi, was sentenced to death in Rwanda, refused entry into Kenya and fled with the help from UNHCR. He has not seen his family since. Mukombozi explained that his refusal to compromise his journalist principles led to the expulsion of his country. “It is costly but rewarding,” he said. Children in this theatre of battle have taken war to be ordinary life. In such situations I have always asked myself: What can I do to change the senseless loss of human life? The answer is, I’ll tell the truth until the victims can enjoy a new lease of life, no matter the consequences. I am aware that this is not the best decision for one to take in life but it is a risk worth taking if the world is to register reasonable restoration of dignity for humankind (Mukombozi, Robert. (2011) Journalists under Pressure: Experiences from the Frontline. Presentation to UNESCO, Australia). Since arriving in Brisbane, Mukombozi, has completed his Masters of Journalism and Mass Communication at Griffith University. He now writes for The African Executive (http://www.africanexecutive.com/), and has worked for ACESS Community Services Limited asCommunity Development Officer for the past three years.